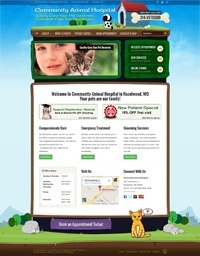 This website for Community Animal Hospital in Hazelwood, Missouri, is simply adorable. I absolutely love this whimsical Wordpress template that I’ve customized with fun animations and illustrations. Website visitors will enjoy exploring this website!